Rather than being an expert on 3D cameras, I've just learned how to do this properly for the first time after spending many days on finding existing resources and learning from those, so the intent of this post is to pass that information on in a distilled format to whomever may find it useful due to being in the same spot as I was just a week or so ago! Since I do not have a blog of my own I decided just to post it here! My own code has been based mainly on this (YT) video tutorial by ThinMatrix and this camera collision script by Unity forums user ChadrickEvans, but does not copy either solution verbatim. I actually recommend watching the video tutorial before reading any further since it visually explains the maths that I'll be providing in text, so might be easier to follow. The code in this post will be pseudocode based on C-style syntax with as little unnecessary fluff as possible. It's about the fundamental concepts and not tied to any specific framework or engine. I will be treating the y axis as up; if your coördinate system works differently you may have to swap axes or invert numbers. Third person camera following a character. Free camera rotation controlled by player. Collision detection, sliding camera out of obstacles. Resetting camera to locked mode behind character. Locked camera rotation not controlled by player. To begin with we will need to know the camera's maximum (default) distance from the character (you'll have to tweak this and see what feels good!) and what point relative to the character should be treated as the pivot of the camera; in your game that might just be the character's position as is, but in my game the character's pivot is at their feet, and so I needed to add a vertical offset off the ground. 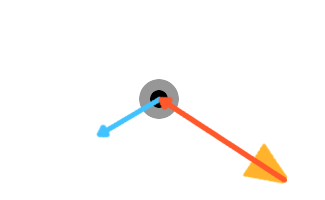 The distance from the character does not refer to any specific axis, but the three-dimensional distance from the pivot on the character (i.e. its position plus the offset), i.e. 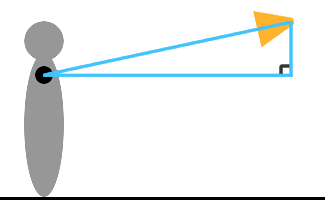 the length or magnitude of the vector resulting from subtracting the pivot of the character from the position of the camera, as shown by the line drawn between the pivot and the camera in the picture below. 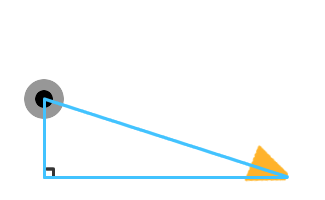 The line between the ground and the pivot represents the offset. We will also be needing two mutable values: the angle by which the camera has been rotated around the character's pivot on the y axis, and the pitch of the camera (how much it is looking up or down on its x axis). You might not want to default your pitch to zero (since that means the camera is looking straight ahead rather than for example slightly downward) so that's something to play around with. Both of these angles, and indeed all angles throughout this codebase, will be in radians and not in degrees. If you know your terminology you might be wondering why the angle isn't referred to as the yaw—we will be calculating that based on the angle as well, but it's not going to be the same value, as you'll see. But for that reason we will also declare a yaw variable, and while we're at we might also declare a roll (the z axis rotation) even though we won't actually be using it in this tutorial, but at least you'll know where in the code to put it if you do want to play with it as well. Finally since we want smooth camera movements, we will be using variables to hold the actual current pitch and angle of the camera, whereas the previously declared variables are for the intended final values that the current values are going to be interpolated toward over time. This is where having watched that video by ThinMatrix is really going to pay off! If you've ever calculated a directional vector using the cosine and sine of the angle, you'll understand why this works. If not, that's a recommended concept for you to look up, but not needed to understand to progress further from here, so let's get on with the calculations! 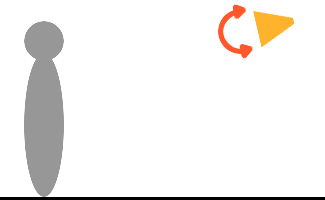 At the top of our update function we want to linearly interpolate our current pitch and current angle to approach the desired values. We also want to clamp the pitch between the minimum and maximum defined earlier so that we can't turn the camera upside down or below the ground. This is also a good place to put the yaw calculation from before. I've introduced a new constant here which is the rate at which the camera will lerp (linearly interpolate) toward the desired pitch and angle, i.e. its turn speed. The deltatime is of course the time since the last frame or update. Note that if you're using C/C++, the built-in modulo operator % doesn't work on floating point values and you'll have to use (std::)fmod() from the C maths library instead. This post got too long for the forum limit! So I'm splitting it up! Here's the rest. You may need to invert one or both of these values to get the desired result. I'm personally dealing with this on a lower level in my code where the input gets processed based on user settings in the first place and so my camera code does not need to deal with this. Remember to always allow your users to manually configure camera axis inversion because people are used to different configurations and might not be able to play comfortably at all with one or the other—also differentiate between third and first person inversion as people may have different preferences for each of those too in case you're planning on having a first person mode in your game as well! Note that we are updating the desired angle and pitch values and not updating the current pitch and angle values directly since these will get lerped toward the desired values in the update code that we just wrote. There are many ways to fine-tune this, but we will be going for a very simple but effective solution to preventing the camera from clipping through walls that's a solid foundation to work from, if not even enough for many games. 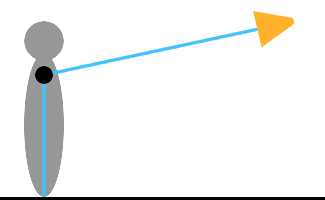 All this requires is a way to cast a line or ray from the target character's origin to the camera's position and see if it intersects with any geometry, and at what point the first (closest to the character) intersection happens and calculating a new camera position and distance based on that, bringing the camera closer to the character as necessary. Footage from ~3:26:34 into this gameplay video on YT from channel RabidRetrospectGames. I've not yet done this in my own game, as you can see in the GIF at the beginning of this post, but I plan on doing so! We cast a line from the character to the camera. Not the other way around. This is important. We do this so that the first thing that the line intersects with will be the closest to the character, so that we know for sure that if we move the camera there, that's where the character will be visible. If the camera were all the way behind the house and we did it the other way around we would instead have found the wall on the other side of the building, and moving the camera there wouldn't have brought the character back into view! So for this I'm assuming that you already have some sort of library in place that you're already using to check collisions between the player and the level geometry, and that this library provides a line or ray cast function. 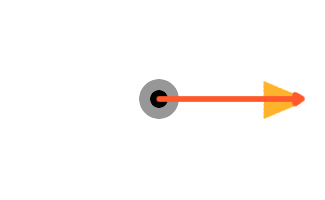 The only difference between the two is API: a line cast specifies a start and an end point whereas a ray cast merely specifies the starting point and a direction as well as an optional length. Since we want to be checking between the character's origin and the camera's position I'll be using a line cast between the two. bool hit; // did the line cast actually intersect with anything? Fiddle with this number as you wish. Now we need the directional vector of the line between the hit point or camera and the character's origin so that we can offset in the right direction. Here we are subtracting the hit point position with the added offset from the origin position and getting the length, also known as magnitude depending on your maths library, of the resulting vector. Since we drew the line between the origin and the camera we know that the direction of the vector is equal to the one that the camera is already pointing, and so what this code effectively does is to just kind of slide the camera in its own forward direction along this line closer toward the character. Now, this might get choppy if the camera just warps from one distance to the other and we might want to lerp this as well. I've found that it's best to warp directly if the new distance is shorter than the old one because otherwise we risk seeing the camera clipped through the obstacle for a moment, whereas I certainly do prefer a lerp when the new distance is longer since that means the camera now has room to comfortably back up again with nothing in the way. And then of course we need to actually do the lerping somewhere. If we've detected a hit we want to lerp toward the new distance if it is greater than the old one, but otherwise warp directly to it. If we did not detect a hit at all we want to lerp toward the maximum distance. I've introduced yet another constant here for the speed of this movement along the line between the character and the camera that you can fiddle with to get your desired results. Of course you're probably also going to want to filter somehow what geometry the line should actually detect so the camera doesn't try to avoid minor things that aren't actually really in the way, but that's very API-specific, so I left this out here. If you've ever played a 3D Zelda game, you'll know that they let you use something like a shoulder button (or the Z trigger on a Nintendo 64 controller) to reset the camera behind Link. This is also done in my game as evidenced by the GIF at the top. In fact, this is the only way to control the camera in some of these games, as many of them happen to be on consoles that lack a secondary stick. Even when you have one, I think it's a nice feature to have, so let's look at this too! Footage from ~13:43 into this gameplay video on YT from channel TheRealSonicFan. This is fairly easy. We need to calculate the angle that the camera should have around the character according to their current facing direction in order to end up behind their back. We also need to reset the pitch to whatever default value you decided on earlier. Let's whip up a function for this, like we did for calculating position. This time we want to pass in the rotation of the character as a quaternion. The calculation is much the same as for calculating the direction for the hit point offset before, but this time we don't care about the y axis, and then using atan2 on the resulting vector gives us the angle. We need to use a 3D vector initially since the quaternion is 3D, but since we're really only calculating an angle for a 2D top view rotation, we end up only using the x and z axes after that, effectively a 2D vector. 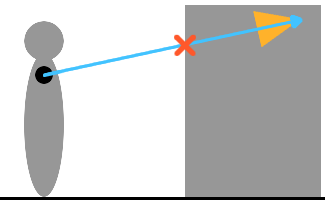 Now all you need to do, when the user gives you the input you want to assign to this action, is to set the desired angle (not the current angle—we still want to make use of our nice clerp from before to make the current angle interpolate nicely to the new angle, not just warp there) to the result of this calculation, and likewise reset the desired (not current) pitch to the default value. Once again I shall bring up an example from the Zelda series. You may or may not want this functionality! While Breath of the Wild relies entirely on the player to manually control the camera using the secondary stick and games like Ocarina of Time rely on a combination of resetting and also automatically following the turning motions of character, The Wind Waker offers both: if the player manually takes control, it works like BotW, but if they reset the camera it starts working like OoT instead, somewhat following the motion of the character. I personally like this a lot, so it's what I've done for my game as you can see in the GIF at the top—let's look at this as well as the grand finale! Footage from ~1:26 into this gameplay video on YT from channel GuffyTheWeird. Here the camera is in locked or automatic mode, and as you can see it follows Link as he turns to an extent, but not if he does a full 180 and starts running toward the camera. I've achieved something similar in my game, so let's have a peek at the code! After updating our input management code to modify this variable, we can add to our update function a section to make the camera follow the player's heading to the desired extent with some more maths. 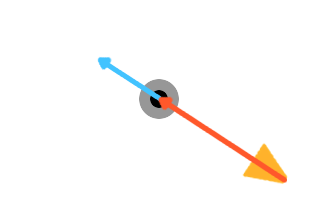 Now we want the dot product between these two directional vectors to calculate how parallel or perpendicular they are to each other. If you're completely clueless on dot products, this page provides an excellent visual guide to how it works. Basically, if they are more or less parallel, we know the camera is looking at the character's back or their face and we don't want to turn the camera, but if they're more perpendicular (forming a right angle) we are looking at the character's side, so they are turning to the left or the right relative to the camera. The Euler vector function turns a quaternion into a 3D vector containing the x, y and z angles separately as radians and is something I expect you to have in your maths library. 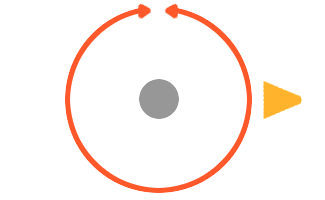 The quaternion in question is the result of multiplying the inverse rotation quaternion of the camera by the rotation of the character in order to adjust for the camera's rotation relative to the character and get a more absolute rotation for the character. After this we are only interested in the y axis rotation angle which will be a negative or positive number depending on which way (their left or right) the character is turning relative to the camera. You might want to normalise this into an absolute sign that's either -1.0 or 1.0 but having the angle scale with the intensity of the rotation seemed suitable to me, so I didn't. Finally we multiply this by the deltatime for smooth goodness and update our desired angle by subtracting the result of this whole expression. Epsilon is a magic small number of your choosing to determine when the character's movement is no longer significant; I went for 0.01. Multiplied by deltatime to make it consistent regardless of frame rate. Too long still! Final part now. Just give me the source already!! Perhaps you don't care all too much how this actually works (which is perfectly valid; sometimes you just want to get on with your dang game!) or you find it difficult to fully grasp everything when it's scattered throughout the post and not in one coherent place. So I'll leave you here with the entire source code in one big chunk! I hope you enjoyed the tutorial and found it useful! // you need to tune all these constants to suit your game! // how much did the character move? Wow! Lengthy tutorial to explain everything, but all in all the code turns out to be quite concise! A simple but effective base for you to build on top of. And me, too! There is also this article on Gamasutra by Yoann Pignole—I haven't really made use of the additional techniques described here yet and so they were not covered here, but it's still an interesting article for those interested in going further! For more video material, there is this GDC talk on camera mistakes by John Nesky who worked on Journey. Read through the whole thing and found some typos, including in the code—I think it should be good now! Completely forgot about this, and I'll make it brief, but I suppose that it's also worth saying a few words about integrating the character controller with the camera, especially if you've never done it before. Since the camera can be looking at the character from almost any angle in 3D space in a sphere around them, transforming player input on two axes isn't as easy as mapping the two directions to the character's x and z positions—however, it's almost that easy! All you really need to do is to multiply the camera's rotation quaternion by the input direction vector, much like we've seen quaternions multiplied by several directional vectors in the camera code as well in the above tutorial. Then as usual you need to throw away the y axis and normalise the vector, and you're good to go! I just added a first person camera mode to my game featuring the third person mode described here, and learnt that it required very few additions to the previous code, so I thought I'd cover that here as well! As you can see here, the first person mode matches the camera angle and pitch of the third person mode rather than turning around to match the facing direction of the character; this is somewhat odd, but a lot less disorienting, and how modern games tend to do it. I'm thinking instead I might add a short animation of the character turning toward the facing direction of the camera before swapping modes. To begin with, we'll need a variable to keep track of the current mode. It could be a fancy enumeration with named values, but I'll just use a boolean that decides whether to use first person mode or not. We also want to handle the camera control (whether using a mouse or a joystick or otherwise) separately from the third person mode, because a lot of people need different inversion settings for first and third person depending on what they are used to and might not be able to comfortably control the camera otherwise. Additionally you will of course also have to decide on an input that tells the camera to alternate between the first and third person modes. For the simple implementation covered here, you need only change the value of the _first boolean to do so. Now we need to jump into the update() function that for the third person code deals with all of the per-frame calculations such as interpolation, line casting and finally setting the new rotation and position of the camera. That's it! For first person we really only need to glue the camera to the character's head and deal with none of the distance or collision stuff now wrapped up in that else we just added. The character's own collider that prevents them from walking through walls will also prevent the camera from doing so. The same camera and character controllers used for third person, as well as the pitch limit, will still work just fine, possibly adjusted for those differing inversion preferences. Finally, since the camera now probably is inside of your character model, you probably want do deäctivate rendering them when going into first person mode, so that their geometry doesn't get in the way, or perhaps switch to a version without the head if you still want the player to be able to look down on their body. Up to you! Thank you! <3 Slapped on a little addendum in the post above, too! EDIT: oops, just noticed I've been writing 'perpendicular' where I meant 'parallel', fixed! Addendum for first person mode added above!